We have just returned from two weeks in South Africa. 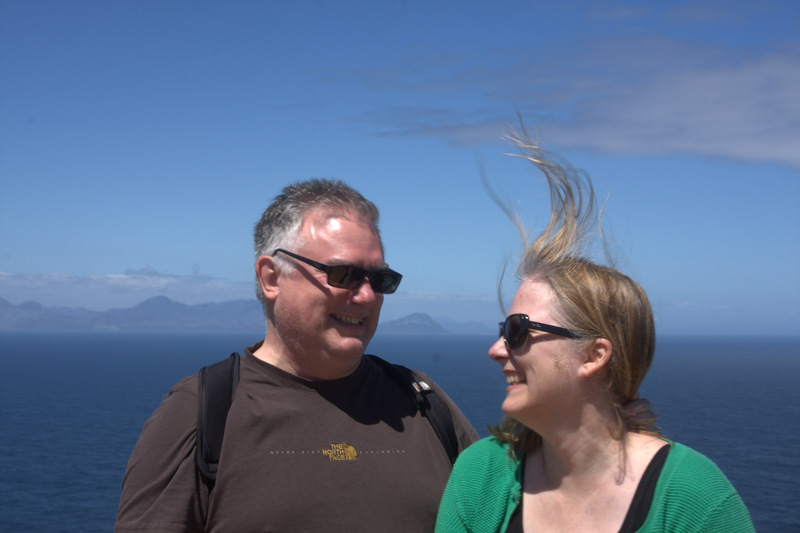 We both had work commitments there – Doug in Cape Town, and me in both Cape Town and Johannesburg. It was meant to be a mix of work and holiday, with a few days just for us at the end, but as often happens with us, the work spilled over on the holiday time. Nonetheless, the important thing to know is that IT IS WARM AND SUNNY DOWN THERE!!!! These photos were taken on the beach in Llandudno. I think this is funny because last year I wrote a post called “In which I get whisked off to Llandudno and have a wooly adventure.” Now I can claim to have blogged about Llandudno, Wales and Llandudno, South Africa! After this lovely morning spent on the beach, we spent the next nine days working. In fact, things got pretty intense for a while (my new job is very demanding), so I spent a lot of that time burning the candle at both ends. I also flew back and forth to Johannesburg, where I was teaching and holding meetings. At the end of the trip, we tried to put the work aside and have a few days of relaxation. We spent two of those days at the Spier Wine Farm in Stellenbosch. Spier is acclaimed for its sustainability efforts – it is one of 29 WWF Conservation Champions, is organically certified, and is renowned for its eco-tourism. It is also fantastic in every single way! I loved it! I want to go back tomorrow! The thing I enjoyed most at Spier is the artwork. They have art everywhere, representing many contemporary African artists: sculpture, ceramics, painting, textile arts, beading and mosaics. I loved their mosaic garden, a very contemplative space which contains some beautiful mosaics commissioned by Spier from African artists. One of the things you will find in South Africa, is that the sun is very strong. After our first day on the beach in Llandudno, I insisted that Doug buy a hat. In fact, I made him buy a baseball hat, despite his comment that wearing a baseball hat lowers your IQ by ten points. Not so, I said! 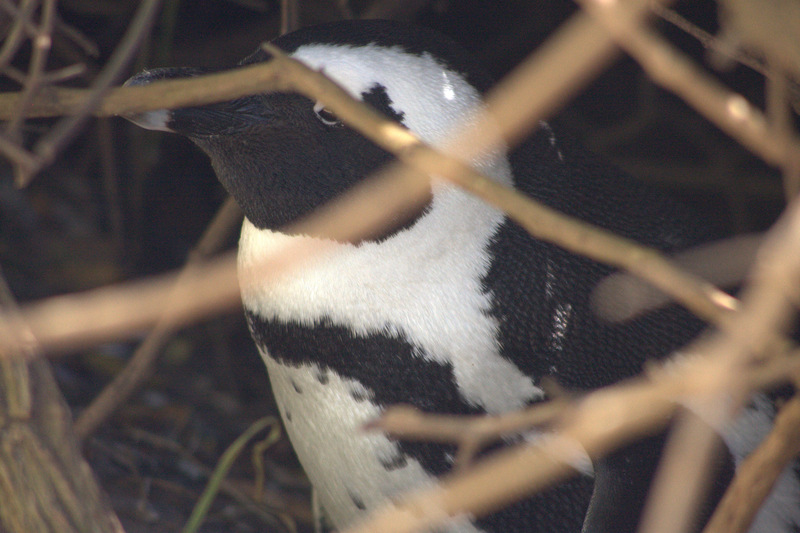 I would love to show you lots of charming photos of Kalk Bay. It is a charming place. However, work interfered while we were there, and I was up all night sending off emails and fretting about things. We did have fun there poking around in the shops and galleries, but it was not as care-free as I would have liked. So that explains the “a lot of work, a little fun” from the title of this post; what about the knitting? 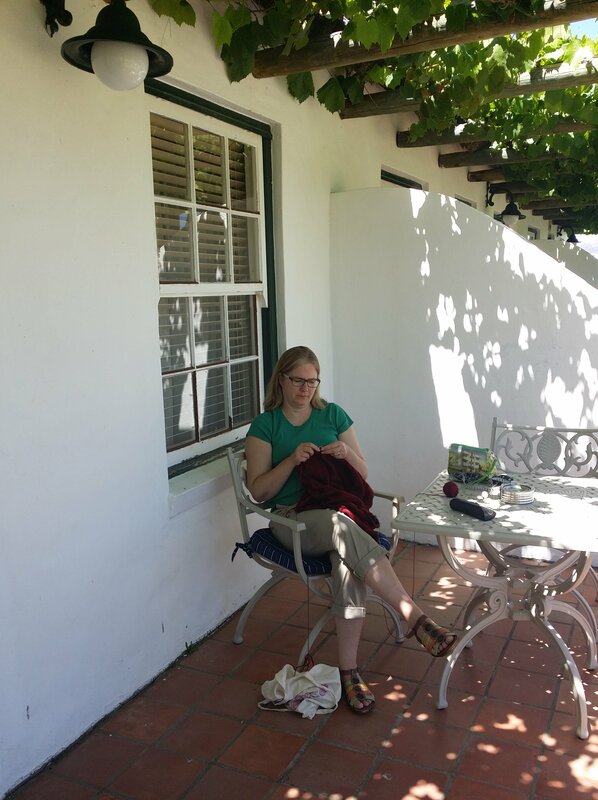 I took only one project with me – the Falkenberg jacket I am knitting. I hardly had it out at all, although I did manage a bit of knitting now and then. Here is a progress photo I took there. I knit up to where I separated for the arm holes, and then I finished knitting the right front. There is still LOADS of knitting to do on this one. I will end this post with a photo I took from the car while driving back to the airport yesterday morning. 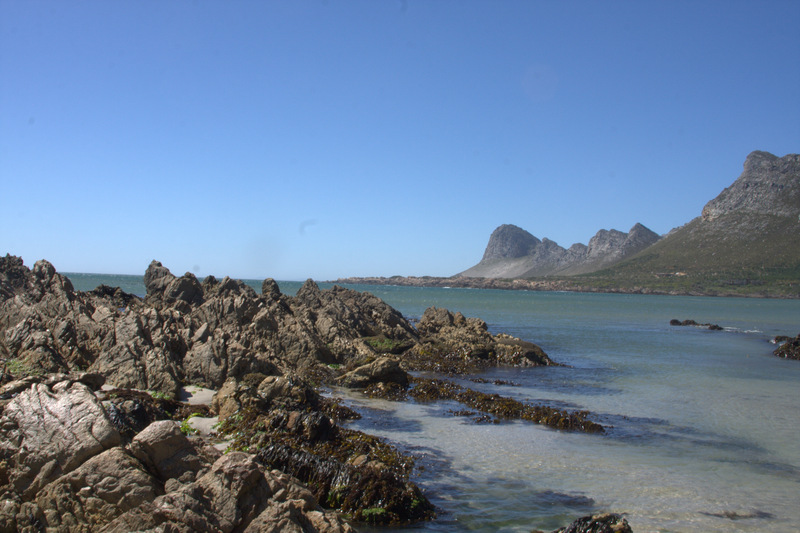 We took a long, twisty route back from Kalk Bay, driving along some fantastic beaches. This beach had a number of wind surfers seemingly flying through the air. Now I am back in the cold, grey, UK winter. It got dark today just after 4pm. 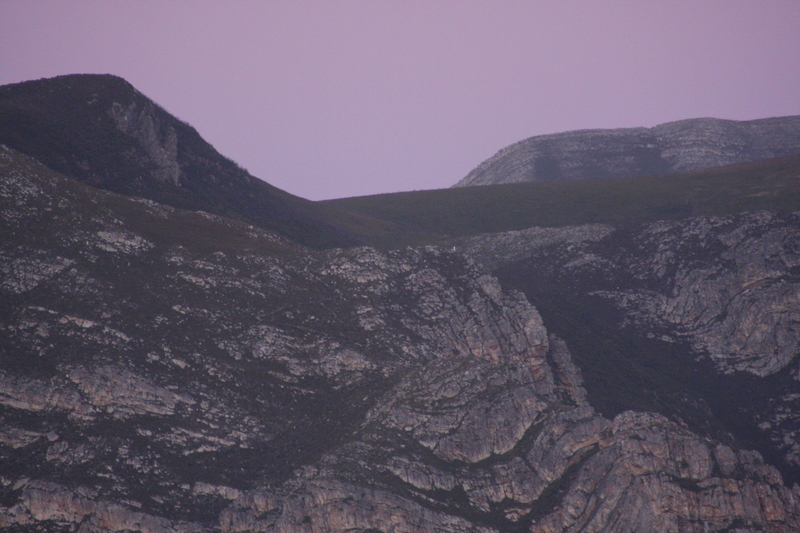 But, I am happy to have spent some more time in the beautiful Western Cape. 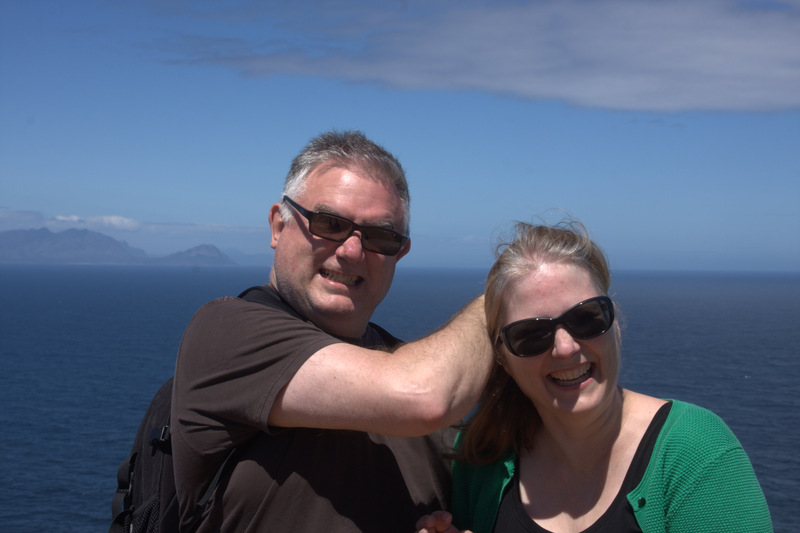 Doug and I are on the Western Cape of South Africa, trying to recover our equilibrium after the disastrous US election results by avoiding politics in specific and news in general. We spent our first day in Cape Town, walking along Sea Point, and having dinner in trendy Camp’s Bay while enjoying the sunset. We then left for Tulbagh to get away from it all. 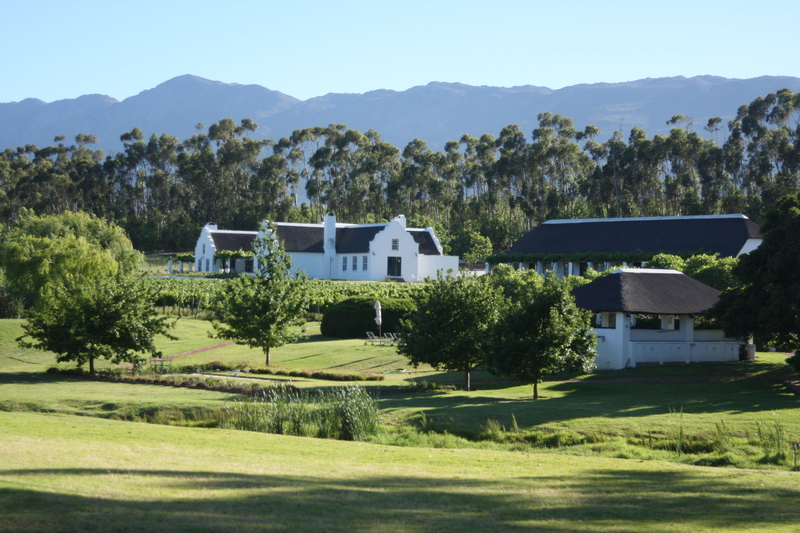 (Virtually everyone we talked to in Cape Town said “Why would you go to Tulbagh? There is nothing to do there!” PRECISELY. We once again stayed at Rijk’s Country House, a little slice of heaven. Need I mention the fabulous restaurant (Reuben’s at Abalone House, run by celebrity chef Reuben Riffel)? The luxurious spa? The lovely staff? It would be easy to check in and never leave the hotel, but then you would miss the little gem that is Paternoster. How could you not love a town that has a house like this one? We had booked into the Abalone for one night, intending to have a glimpse of Paternoster and then head back down to Cape Town. When it was time to leave, we found we couldn’t – we most happily stayed for an extra night. We have had an amazing time. Unfortunately, we must now get back to work, although we will still be here in South Africa. Doug has a very hectic schedule of meetings all week in Cape Town, and I have caught a quick flight to Johannesburg where I start teaching tomorrow. Soon enough it will be time to face up to the mess of the real world and contend with baboons of a different sort. In the meantime, hello from South Africa! 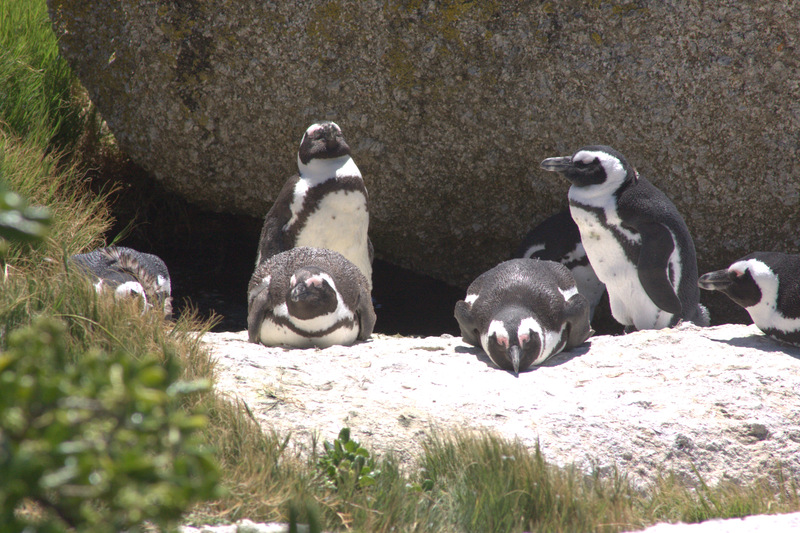 I have just returned from Cape Town, South Africa! I spent two amazing weeks there, during which very little knitting-related activity took place. 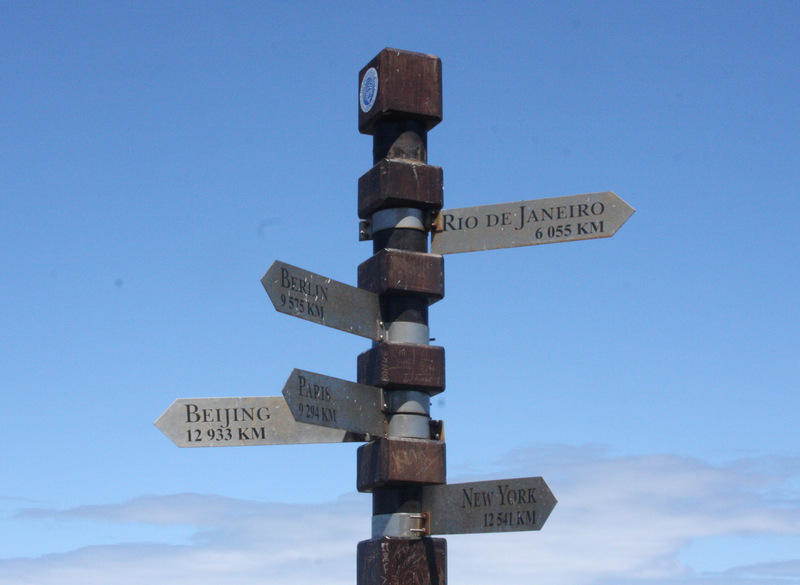 The Executive MBA programme at the Henley Buiness School has a required module on Reputation and Responsibility, for which the entire class travels to Cape Town to work with NGOs and Social Enterprises. My team was assigned to work with Shonaquip, a company which designs and manufactures wheelchairs and seating support solutions for disabled people, and which also provides assessments, fittings, follow-ups, maintenance and training. We were blown away by Shonaquip, and the other NGOs involved in this project. It was an extremely emotional week for all involved, as we came to grips with the enormity of the problems facing South Africa, and the determination and talent and heart of its people. We were humbled by the dedication and boundless energy of people and organizations determined to provide dignity and solutions in the face of overwhelming poverty and the legacy of apartheid. I saw very little of Cape Town, I’m afraid. Tourists to Cape Town usually go to the top of Table Mountain for fabulous views, and to Robbin Island, where Mandela was imprisoned. I didn’t manage either of these, nor did I get much of a chance to experience Capetown’s nightlife or great food. For the first 8 days that we were in South Africa, I spent virtually all my time either working with my team in the hotel or at Shonaquip or its clinics in hospitals and townships. I did manage some early morning walks with Doug along the sea wall and two lovely seafood meals with classmates. The rest of the time was late nights working and room service. I wouldn’t have missed the experience for the world. The coast is beautiful and rugged, and around every corner is another breathtaking view. 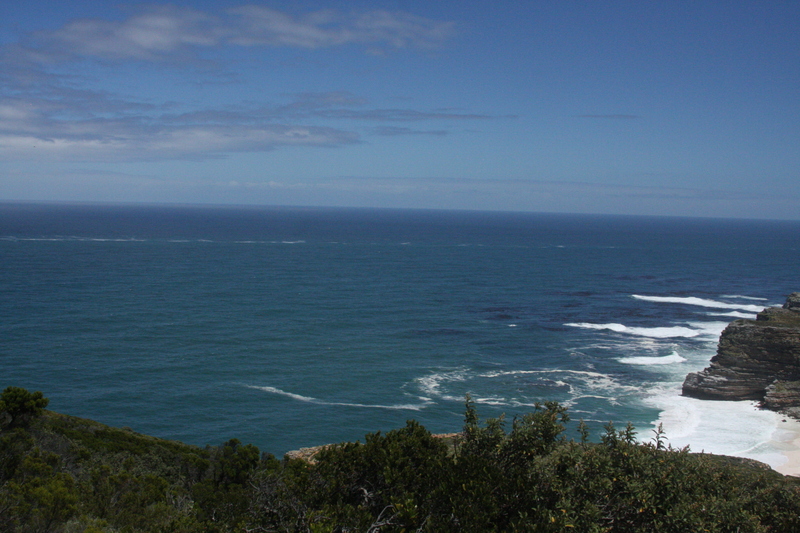 We drove through the National Park to the Cape of Good Hope. 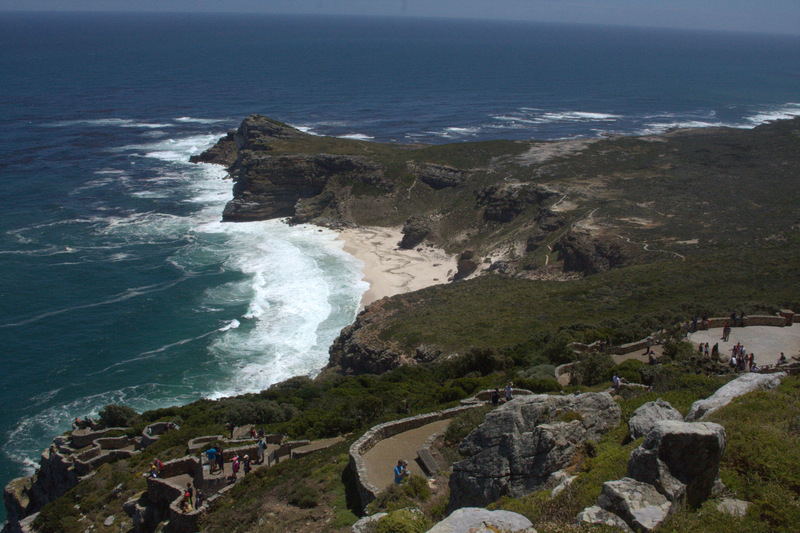 Yes, I went to the Cape of Good Hope!!!!! 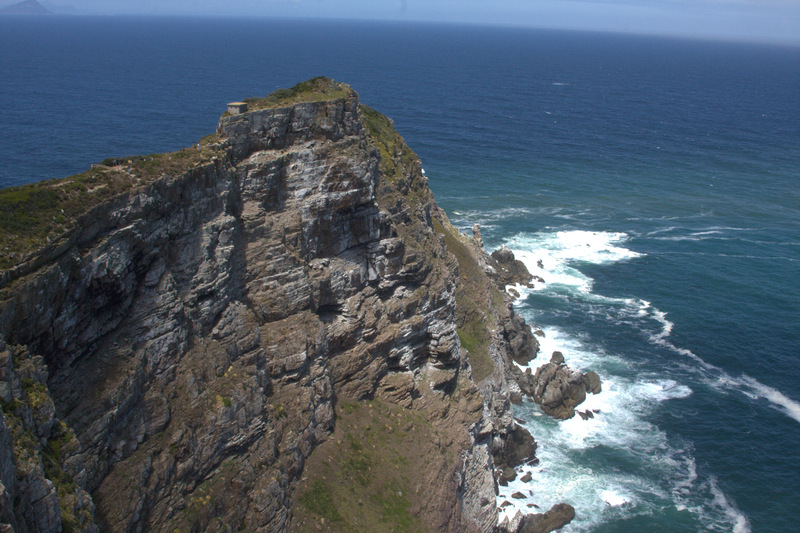 It’s an incredible experience as you stand on a spit of rocky promontory with the Atlantic Ocean on one side and the Indian Ocean on the other. We were there on a gorgeous day, very warm and sunny, but the wind and surf were quite rough. You can readily imagine why so many ships wrecked along this point. For those of us who grew up reading books about the early ocean explorers, this is a very romantic and powerful place to be. Some of you may know that I am afraid of heights. I balked at walking out to the end of the Point. 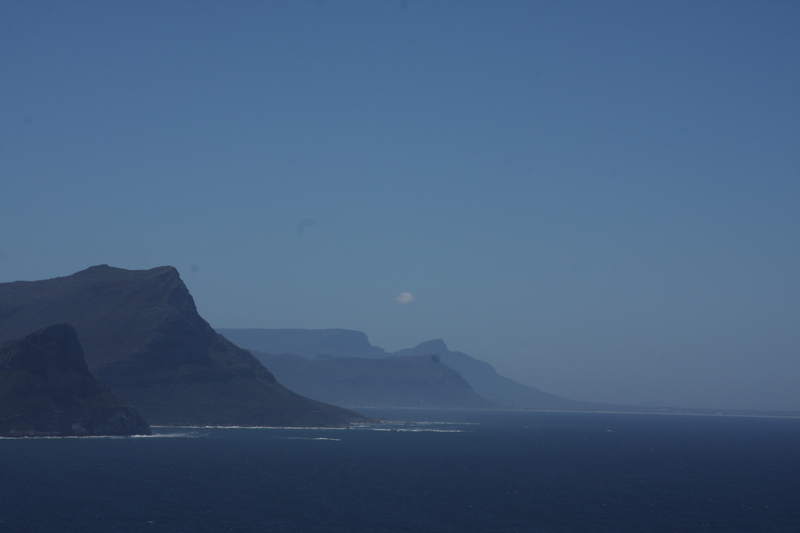 Doug said “No way are you going to come all of the way to the Cape of Good Hope and not walk out to the end of the trail!” He was right; I only had a few bad moments and the experience was totally worth it. Oh well! 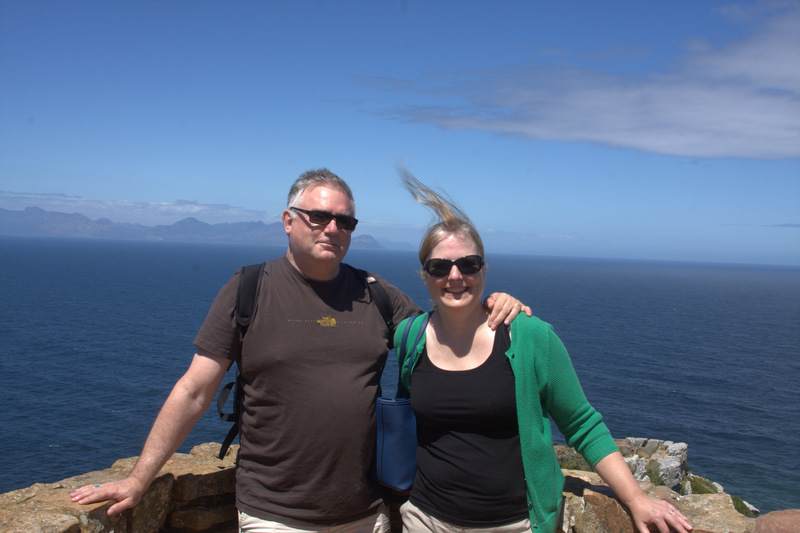 I stood on the Cape of Good Hope, and I have the wind-swept hair to prove it! 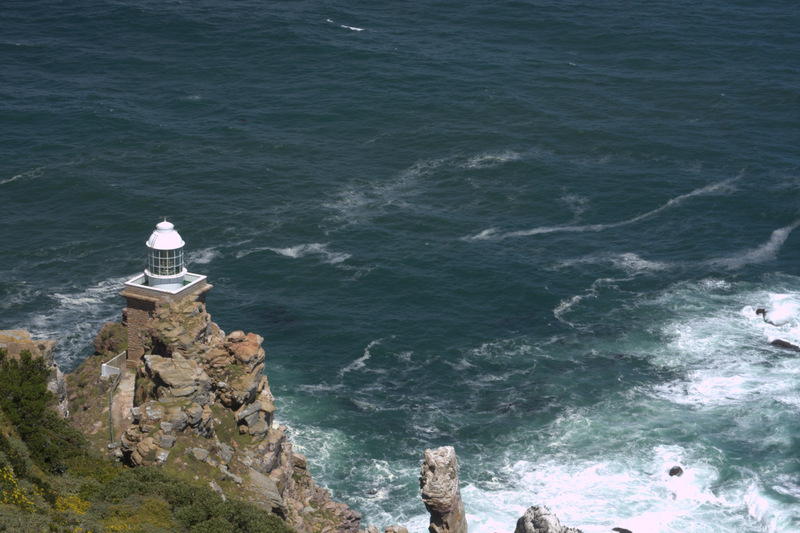 Hermanus is widely-acknowledged as the best land-based whale-watching spot in the world. You don’t need to hop on a boat to see the whales here; you sit on the rocks and the whales play in the bay, sometimes just metres away. 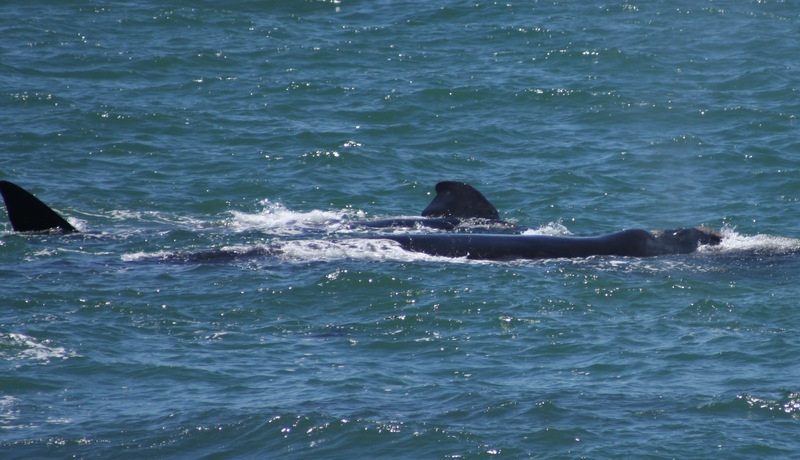 Southern right whales spend part of the year here – calving takes place in August and September and the males arrive for mating in October, when the season peaks. We were there past the peak season so we missed the sight of dozens of whales; nevertheless we sat on the rocks the first day and watched three whales, including a mother and her calf, play in the water just fifty metres or so from us. I can tell you that it is very difficult to get photos of whales actually breaching the water. It takes great patience; kudos to Doug. 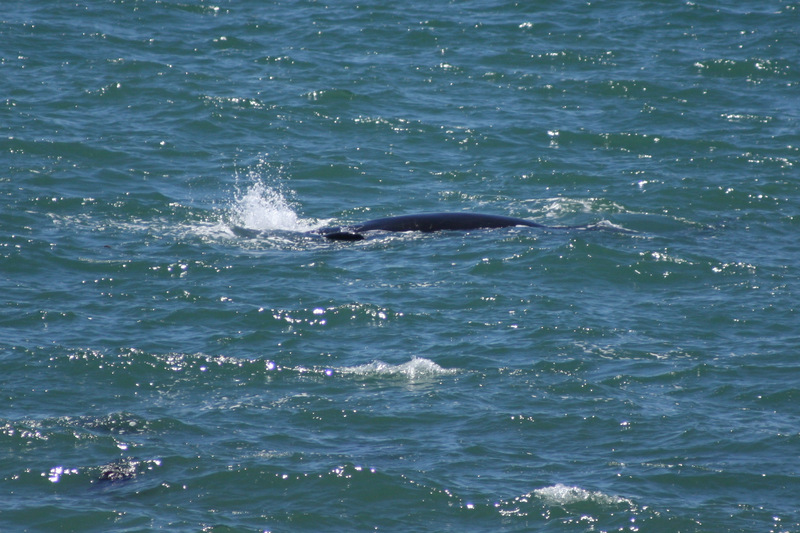 He snapped this photo the next morning of a whale a little further out from us. 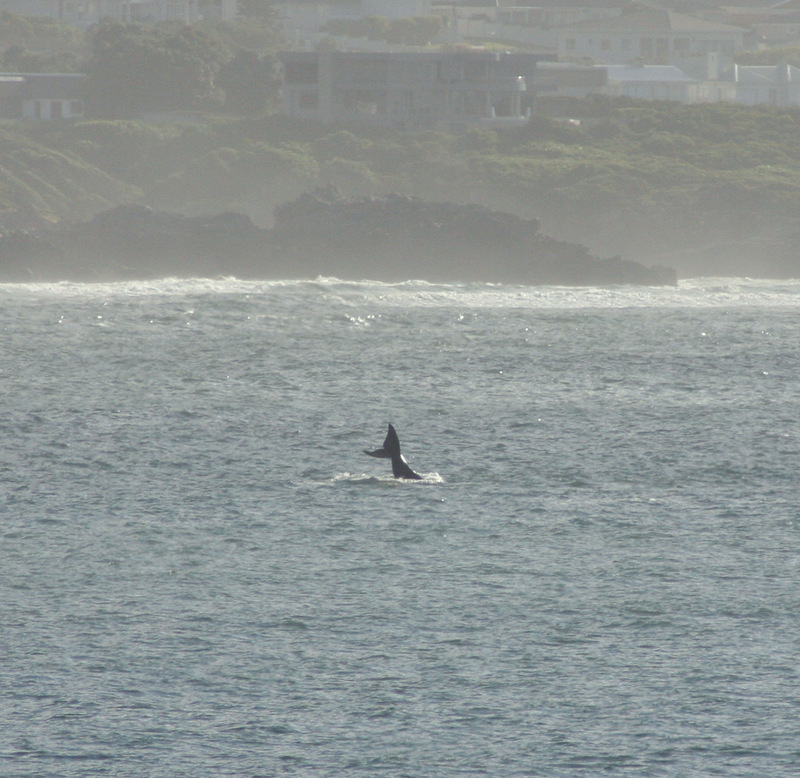 This whale was slapping his tail in and out of the water and taking jumps for quite a long while. It was a joy to watch. We left Hermanus in the morning and drove up north, through gorgeous scenery, to the lovely town of Tulbagh. There we stayed at the Rijk’s Wine Farm, which comes as close to perfect as any place I have ever stayed. 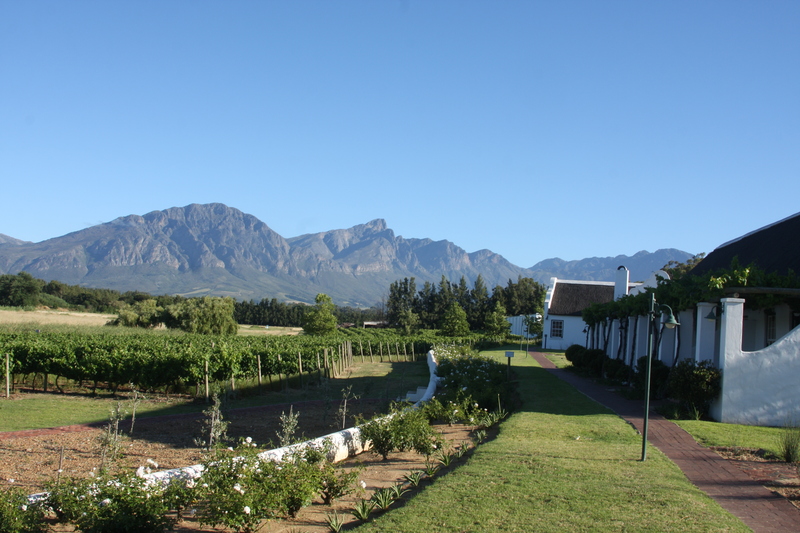 Tulbagh is in a wide valley, perfect for growing grapes, surrounded by mountains on all sides. Rijk’s is an award-winning winery that arguably makes the world’s best Pinotage. The hotel is beautiful, the wine is wonderful, the scenery is lovely – it was so peaceful and gorgeous, I didn’t want to ever leave. What should one do while sitting in the shade of grape arbors, drinking in the frgrance of 1300 white rose bushes, and looking at the mountains, while your husband pours you a glass of fantastic wine? Why, knit of course! Kevin, Carola, Chris and Mike – thanks for the company! I never thought that I would see Africa. Now that I have, I know I will return.